Explore MOCA’s permanent collection through the eyes of youth. Throughout the galleries, audiences can join specially trained 4–12th grade students in conversations and hands-on activities that encourage visitors of all ages to look closely and think deeply about the works on view. The student educators are participants in Contemporary Art Start (CAS), MOCA’s yearlong classroom partnership program. 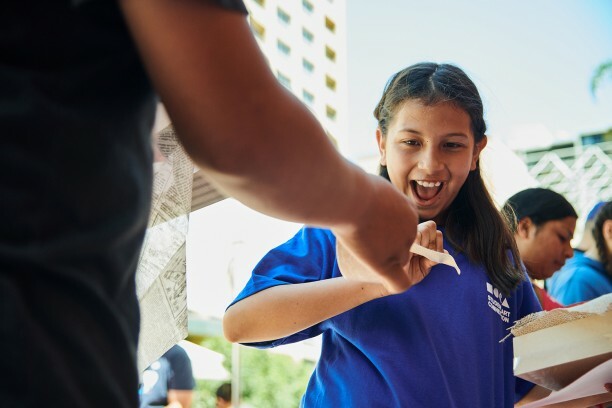 Each year, CAS reaches over 100 classrooms and approximately 5,000 students across Los Angeles County, connecting schools to the transformative power of contemporary art. Explore MOCA’s permanent collection through the eyes of youth. Throughout the galleries, audiences can join specially trained 4–12th grade students in conversations and hands-on activities that encourage visitors of all ages to look closely and think deeply about the works on view.